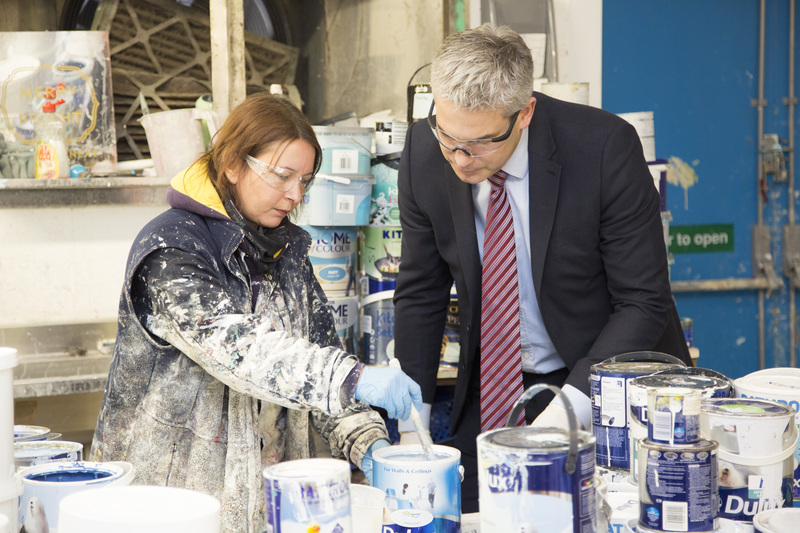 AkzoNobel with Community RePaint, have launched the first UK paint remanufacturing hub for social reuse at the Cambridgeshire Community Reuse and Recycling Network (CCORRN) in March, Cambridgeshire. The hub was formally opened by the local MP for North East Cambridgeshire, Steven Barclay, with other representatives. The technology behind the remanufacturing process has been developed by NewLife Paints Ltd and, through AkzoNobel’s ongoing sponsorship, has been licensed and funded to the Community RePaint Network. The process enables leftover and surplus or end of line paint to be collected and then remanufactured into new containers, with certain additions to ensure its longevity and quality. The Cambridgeshire Community RePaint scheme, at CCORRN, was selected to be the test bed for the new technology because of the established ongoing partnership between CCORRN, Cambridgeshire County Council and Amey, the council’s PFI waste management contractor. Each year in the UK, up to 50 million litres of paint is thrown away either through landfill disposal or via incineration which is an expensive process. 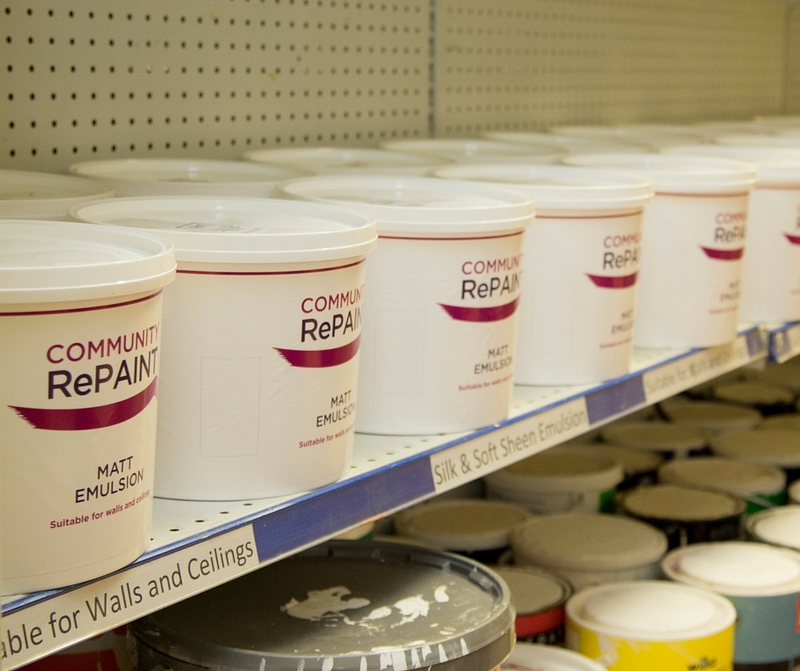 This paint is leftover or surplus to requirements from residents, paint manufacturers, DIY retailers, maintenance companies and waste contractors. Over 50% of this paint is normally reusable and currently 75 Community RePaint schemes across the UK collect some of this paint and make it available for social reuse through community groups and families on low incomes. There is much more that needs to be done to prevent good, reusable paint from being wasted. The Cambridgeshire remanufacturing hub has plans to triple its capacity, collecting and remanufacturing a range of emulsions in neutral and pastel shades. This new remanufactured paint will then be sold at low cost to the community for social benefit. Paint can be taken to Cambridgeshire County Council’s Household Recycling Centres at Witchford, March, Milton, St Neots, Thriplow and Wisbech where it will be collected for recycling. By the end of 2017, AkzoNobel and Community RePaint intend to have four hubs across the UK processing around 500,000 litres of paint. The Community RePaint Network is sponsored by AkzoNobel and managed by independent resource efficiency consultancy, Resource Futures – a partnership that goes back 22 years.